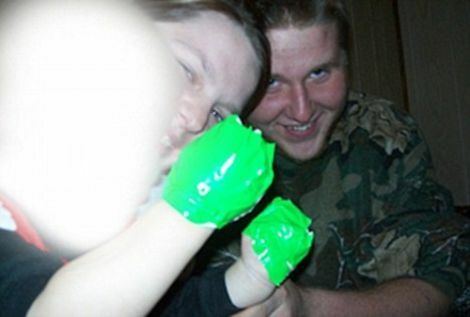 Two teenagers were sentenced to jail after duct-taping a 22-month-old child to the wall. 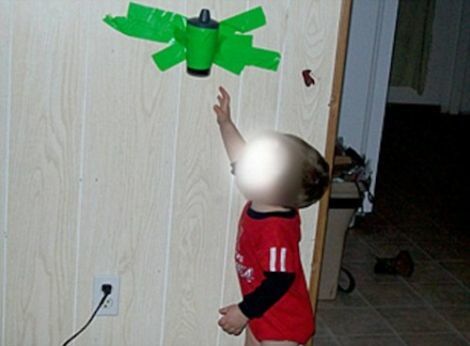 The pictures—here with the child's face obscured—show him stuck to the wall at uncomfortable angles and with tape directly on his bare skin. The mother, Jayla Hamm, 18, was sentence to 10 days in jail and two years' probation, while her boyfriend, 19-year-old Corde Honea, received a sentence of 36 to 60 months in prison—as well as separate sentences for burglary and possession of a firearm. 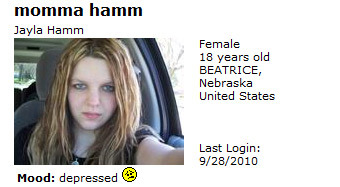 The abuse came to light when Hamm—"momma hamm" on MySpace, where her mood is "depressed" (I'll bet)—showed the photos to a friend, who had the good sense to tell police. The kid will stay with his mother under state supervision.